PUMPS: How are GIW mining pumps related? Historic photograph of GIW’s foundry on the Augusta Canal. GEORGIA – With so many product lines and acronyms, it can seem as though all of the pumps produced by GIW Industries are a bit random. However, the products are more related than people may realize. Each pump is a unique part of a giant family tree and, like any family, we have all shapes and sizes, a few historically significant members, and a handful that are … well, a little odd! Like any family tree, ours starts with strong roots. 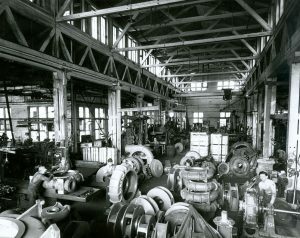 The company we all know today as GIW Industries began in 1891 as a small, privately owned foundry and machine shop that produced saw mill machinery and ornamental iron. In 1914, the company began manufacturing spare parts for the solids handling pumps used in the Florida phosphate industry. Soon thereafter, GIW began designing and manufacturing their own slurry pumps to meet their phosphate customers’ growing demands. This quickly became the sole focus of production, permanently placing GIW in the slurry pump market as an original equipment manufacturer of mining pumps. Today, GIW Industries manufactures 11 product lines: LSA, MDX, MHD, LHD, LCC, LCV, HVF, FGD, TBC, WBC, and DWD. The LCC can be considered the father of the HVF and LCV products, while the good ol’ LSA pump is the grandfather to all of the other product lines. “The LSA offspring all share the original LSA mechanical end design; however, they all differ when it comes to the wetted end. Three or more products feature different hydraulic and pressure design aspects,” Keith said. Of course, no family tree would be complete without its fair share of “crazy uncles” who don’t seem to be related to anyone in particular. Although GIW has retired most of these outliers, it has manufactured a handful of distant relatives that meet the needs of unique applications. The sewage vertical pump (SVP) was developed for a wastewater project in London, while the double-wall dredge (DWD) pumps were custom designed for offshore dredging customers. It’s fascinating to look back at this ever-growing tree and see how customer focus has impacted GIW designs and manufacturing. These unique projects helped the company “branch out” into the pump lines it has today. With pump impellers ranging in diameter from 250 mm to 2.75 metres, GIW has adapted and grown with its customers – and will keep doing so. GIW continues to be a mainstay in the global mining and dredge markets through cutting-edge technology, seasoned design, professional engineers, and a state-of-the-art testing facility. Find the GIW pump that suits your mining, processing or oilsands needs at www.KSB.com/ksb-us/Products_and_Markets/Mining/.